Since its release in 2003 the RC10B4 remains undefeated on a world level having won five I.F.M.A.R. World Championships in a row! In commemoration of our most recent 2WD Off Road World Championship win, we are proud to bring you the RC10B4.1 Worlds Car kit. 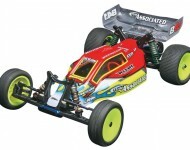 The RC10B4.1 Worlds Car kit comes with the chassis spec'd out the same as the Team Associated buggies that were driven by Ryan Cavalieri, Ryan Maifield, and Neil Cragg at the 2011 I.F.M.A.R. World Championships in Vaasa, Finland.